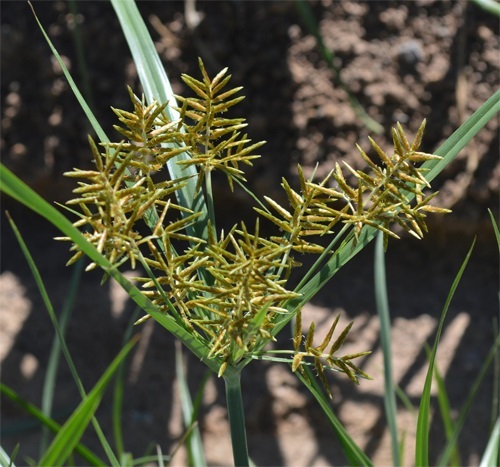 Yellow nutsedge is native to sub-tropical regions of North America. Recently, it started spreading into temperate regions. 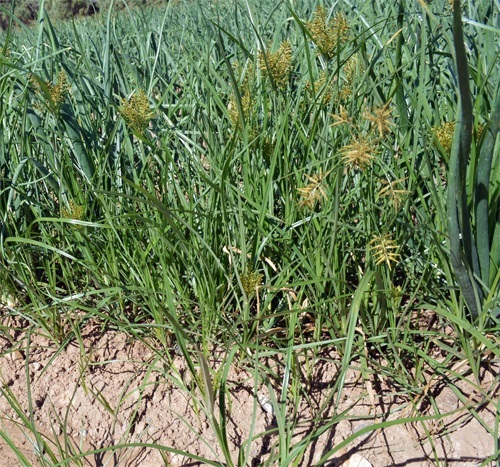 This sedge can become a troublesome weed in crops and turf. In Canada, it is a weed in agricultural fields where potato and soybean is grown. Yellow nutsedge can grow 15-60 cm tall and its stem is triangular. The flowers are 1-3 cm long, arranged in typical umbels and yellow-brown to light brown in colour. The leaves are light green, 10-30 cm long, 2-10 mm wide, and have a waxy surface. Yellow nutsedge prefers wet open areas for initial establishment but can tolerate drought once established.